Close-Out pricing - was $12/now only $6!! SKATERS! The absolute coolest way to carry skate tools, spare parts, your wallet, keys or whatever... is in SKOOZRSTM . So take along something for the ride in your SKOOZRS TM sports wallet. 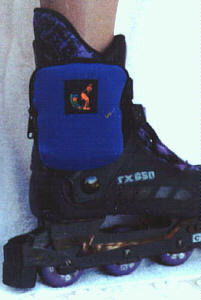 It quickly attaches to the boot of your skates with a VELCRO TM strap. It's the safe and secure way to carry the things you need for in-line skating fun! Made of rugged 3mm neoprene. Measures approximately 4-1/2 Inches X 4-1/2 Inches X 1 Inch: 11.5mm X 11.5mm X 2.5mm. Great for quad skates too!